Whether you are an elderly person looking to remain independent in your own home, or a caregiver, looking for ways to protect the safety of your senior loved one, an elderly monitoring system is something that should be considered carefully. A fast acting elderly monitoring system can preserve independence, minimize risks in emergency situations, and provide peace of mind. Unfortunately, the elderly are prone to falling. Weakened muscles, ligaments, and bones means that on average one elderly person (over age 65) falls every couple seconds, with 13 million seniors falling each year, and over half of those can’t get back up. The odds are, if you have a senior loved one, they may take a fall, and be unable to get up without help. This can lead to some pretty serious consequences. 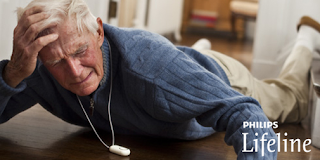 An elderly monitoring system can be an added line of defense in case of falls. Falls can lead to pain, distress, as well as many other problems, such as dehydration, if not detected quickly. The CareGiver Partnership offers a fast acting elderly monitoring system. This monitoring system is a pendent system, which the senior wears about their neck. The first medical alert pendent can automatically place a call for help if a fall is detected or the wearer can press the button for fast access to the Lifeline Response center 24 hours a day. These days many claim that cell phones, and other devices are better options for senior monitoring because you are not tethered to the signal, or required to be at home to use the device. However, the Philips monitoring system offers a distinct advantage, which is that even if the wearer is disoriented, unconscious, immobilized, or otherwise unable to push the Personal Help Button, the AutoAlert option can call for help if a fall is detected. This is an added layer of protection. And it is the first pendant service to offer this feature. A monitoring system is extremely beneficial for senior health. Delayed help can lengthen recovery, jeopardize independence, and lead to emotional distress for the senior. Having the peace of mind that is afforded with an elderly monitoring system is not only great for the senior, but for the caregivers as well. Whether you use Philips- Lifeline with AutoAlert, or choose a different option, when selecting a monitoring system for your senior loved one, look for fast access, ease of use, something waterproof, that will not be out of batteries, or out of reach when help is needed. A monitoring system will bring peace of mind, and help when an emergency happens. Philips is the #1 elderly monitoring system, with a long history and the latest technology. Customers of The CareGiver Partnership get a special discount on this service, including a free activation and a $10 discount on your next order with The CareGiver Partnership.